QUICKTIMER_R16X Software supports turning on/off each relay automatically during the predetermined duration. First set the duration that you want the sequence to be active. Time periods can then be set where the relay is energized within the set duration. QUICKTIMER_R16X can control up to 16 relays in any given pattern for almost any duration. It's great for Science Projects, Bench Testing, Lab Experiments, and more! Quick Timer Software is compatible with any of the ProXR and ProXR Lite boards. You can use any interface offered, Quick Timer will communicate with any of the Wired, Wireless or Network interfaces. Quick Timer Software supports controlling each relay automatically during the predetermined duration. As in the example above the duration must be set first. Each relay on the board can then be controlled with their own time sequence within the time duration. As an application that controls hardware, it has to be reliable. There are many factors effect reliability, the connection could be broken, power failure, the computer could crash. It is easy to create software that run perfect under perfect conditions. However, real world conditions is what Quick Timer was developed to handle. Time Travel can override the current computer clock with any time value! It can change the running speed of the computer clock. If the speed is set as 3600 times, a day will pass just in 24 seconds! Time Travel is a handy tool for testing applications based on the computer's clock, like timer software, schedule software, or automation software. Time Travel provides you a very fast way to test the Relay Timer, Quick Timer and N-Button Software we offer. Time Travel has a load preset function, where a list of configurations can be loaded into the program for the convenience of the user. 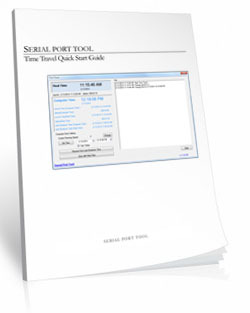 Users can also create a preset within the program and export the list for future uses. Time Travel will remember the settings from the previous run time and load it upon its start. The program does not need to be configured each time it is being used. Time Travel will also automatically reset the system time back to the current local time after exiting the program. It will only affect the system time during its run time, and it will not change time setting after exiting the program. When done exit the program, your computer clock will be set to your current local time automatically. Time Travel can override the current computer clock with any time value! It can change the running speed of the computer clock. If the speed is set as 3600 times, a day will pass just in 24 seconds! Speed up your computer's clock and test quickly using Time Travel! Save time and frustration by making changes quicker than real time! Time Travel is included with Relay Timer! 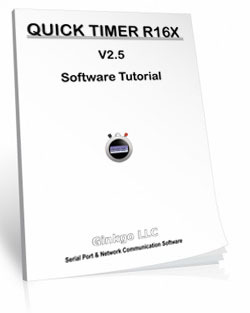 Below is the Software Tutorial for the Quick Timer R16X.